"The responses of Christ and Mary, precisely as poor, virginal, and obedient, possess universal significance, that is to say, are crucial for understanding the meaning and form of the human response to God." The consecrated state begins and ends in the yeses of Christ and Mary. Christ’s yes is inscribed in his Incarnation and death on the Cross, his humiliation and sacrifice for the sake of his bride the Church, his not deeming “equality with God a thing to be grasped” (Phil 2:6). He takes on both the ontological poverty of the creature and its expression in the lived circumstances of poverty among an obscure and powerless people as the only adequate means of expressing the riches of God.1 The three evangelical counsels that together offer the fullness of consecration participate in this paradox and in the virginal and fruitful giving-of-self entailed in Christ’s nuptials with his Church and obedient carrying out of the Father’s will. To read this article in its entirety, please download the free PDF, buy this issue, or become a Communio subscriber! 1. Redemptionis donum, 12 (1984, hereinafter cited in text as “RD”). 2. Redemptoris Mater, 39 (1987). The tight unity of the specific vocation of consecration and the universal vocation of “the Christian state of life” suggests the interiorly nuptial character of the sequela Christi as such. That the human vocation is structurally nuptial, of course, finds support in Scripture. Consider the entire legacy of the prophets’ use of the analogy of marriage for Yahweh’s stormy relationship with Israel (see, e.g., Hos 1–3; Is 54:1–17; Is 62:1–5; Jer 3; Ez 16), culminating in the repeated New Testament use of the image of “the Bridegroom” for Christ (see, e.g., Mt 9:15; Mk 2:19–20; Lk 5:34–35; Jn 3:29; 2 Cor 11:2; Eph 5:27; Rev 19:7–8, 21:2, and 9). 3. Hans Urs von Balthasar, “The Layman and the Church,” trans. 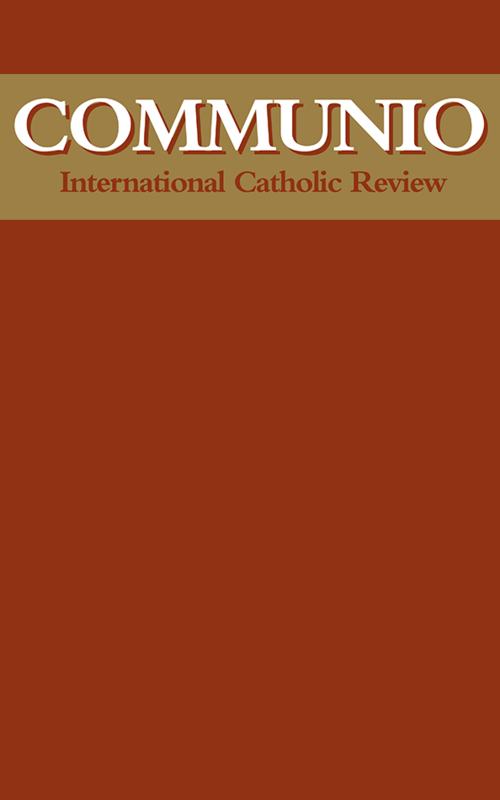 Brian McNeil, in Explorations in Theology II: Spouse of the Word (San Francisco: Ignatius Press, 1991), 315–331, at 330 (emphasis original); id., The Christian State of Life (San Francisco: Ignatius Press, 1983), 205. Cf. also Joseph Ratzinger, Introduction to Christianity (San Francisco: Ignatius Press, 1990), 208–212. 4. Balthasar, “The Layman and the Church,” 315.